All things must pass but beauty will stay on: Jakarta’s premier ivories operator explores the most romantic reaches of psyche. 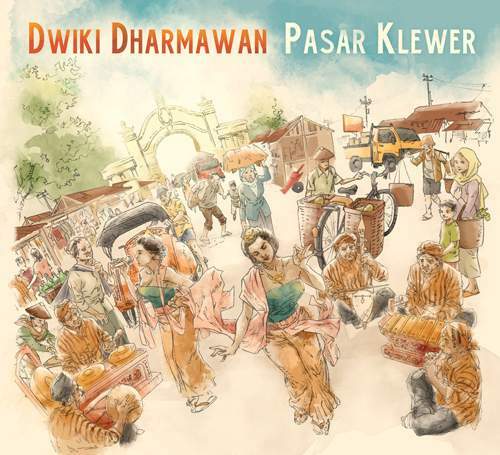 Dwiki Dharmawan’s international debut "So Far So Close " was a retrofuturistic wonder in its use of cosmic synthesizers, but “Pasar Klewer” basks in a different kind of glory, with acoustic piano – the maestro’s only instrument of choice now – lending these two discs a classical tincture. Tangible from the start of the title track, though, DD’s recital mindset is increasingly stricken with Indonesian melodies which coil around the serpentine rhythms that Asaf Sirkis and Yaron Stavi weave throughout the album. Time signatures are in constant motion here, yet while the presence of gamelan and Gilad Atzmon’s sax on the incidental-to-sublime “Tjampuhan” (think Satie in the jungle) can’t be surprising, the blues of Robert Wyatt’s “Forest” – first voiced by Boris Savoldelli and then cleansed acoustically as the record’s finale, with Mark Wingfield’s six-string lace – brings on a rather unexpected delight.